A Lesser Love is a book of love poems and elegies for those who have fumbled and stumbled and disappointed. These are poems of love and departure for romantic partners, family members, even countries and communities. 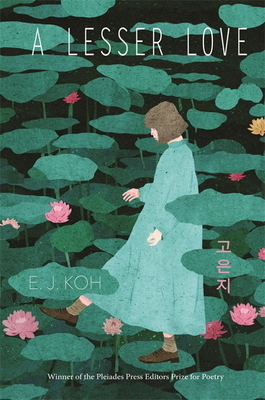 Raised around diasporic Korean communities, E. J. Koh has descibred her work as deeply influenced by the idea of jeong, which can be translated as a deep attachment, bond, and reciprocity for places, people, and things. This spirit of jeong permeates this book of poems that are astonishing in the connections they draw and the ties they bind. In A Lesser Love readers will find poems composed of "Ingredients for Memories that Can Be Used as Explosives" and poems composed of chemistry equations that convert light into "reasonable dioxide" and then further transmogrify the formula into a complex understanding of the parent-child relationship. A book of intimate poems that invite readers into a private world, that geography grows wider and more interconnected with each passing page. Through the eyes of mothers, fathers, daughters, aunts, friends, and lovers, we see the tragedy of a sinking ferry, they hypocrisies of government agencies, the aftermath of war, and a very wide view through the Hubble space telescope. With evocative lyricism and profound emotional intensity Koh has crafted a book of poems that charm and delight and profoundly enrich.